A world championship medal is cool, and those glass trophies they give you for the World Cup are swell too, but the memento clothing-maker Fox gave Steve Smith–the reigning holder of both those prestigious downhill crowns–might just take the cake. Actually it’ll shred, spray, splatter and puree the cake with incredible ease. Smith, you see, was nicknamed “the Canadian Chainsaw Massacre” by race commentator Rob Warner last season. 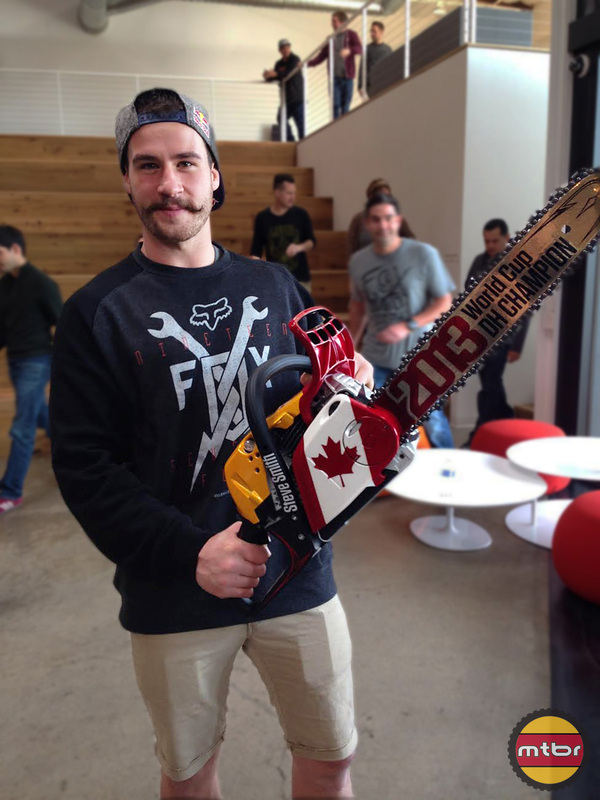 The guys at Fox liked the moniker so much, they commissioned their art department to custom paint a chainsaw in his honor. “A1” is shorthand for Anaheim 1, the first race of the Supercross season which kicked off on Saturday not far from Fox Head HQ. Smith stopped by and was gifted the chainsaw. No word yet on if they let him put it in the overhead bin for transport home.